Cryovolcanism (or ‘cold’ volcanism) describes the eruption of substances that are generally considered to be volatiles on the surface of Earth (eg. water, water-ammonia mixtures, etc.). Cryovolcanism is functionally similar to the volcanism we see on Earth, except that cryolavas (‘cold’ lavas, such as water) erupt at much lower temperatures than rock lavas. As with all forms of volcanism, two conditions must be met for cryovolcanic flows to be present on the surface of an icy moon: liquids must be present in the interior, and those liquids must then migrate to the surface. The latter requirement is more difficult to achieve for cryolavas than rock lavas, given that solid ice is less dense than water. The addition of some amount of ammonia can reduce the density difference – a liquid ammonia-water mixture of peritectic composition (33 wt. % ammonia, 946 kg m3) is near neutral buoyancy in ice (917 kg m3). Though these pockets would not easily become buoyant on their own (given the difference in density of ~20-30 kg m3), they are sufficiently close to the neutral buoyancy point that large-scale tectonic stress patterns (tides, non-synchronous rotation, satellite volume changes, solid state convection, or subsurface pressure gradients associated with topography) could enable the lavas to erupt effusively onto the surface. Image 1: A portion of the RADAR swath taken during the Cassini spacecraft’s TA (Titan-A) encounter on October 26, 2004 (Elachi et al. 2005). This image shows several possible cryovolcanic features, including overlapping flow features (right) and the large circular feature Ganesa Macula (left). Radar illumination is from the bottom. Features caused by cryovolcanism were first discovered on the icy satellites of the outer solar system during the Voyager missions. Examples of these features include the grooved terrain on Ganymede (Showman et al. 2004), the flow features on Ariel and Miranda (Jankowski and Squyres 1988), and the plumes of nitrogen on Triton (Soderblom et al. 1990). Recently, the Cassini mission has found striking evidence for present-day activity in the Saturnian system, namely the observations of jetting water vapour and ice particles from Enceladus (Porco et al. 2006). It was unknown whether Titan, Saturn’s largest satellite, had similar cryovolcanic features until the Cassini spacecraft arrived at Saturn in 2004. Previous images of Titan taken by the Voyager spacecraft were barely able to penetrate its thick organic haze layer. Near-infrared observations from Earth, while able to detect surface contrasts, had too low a spatial resolution (>50 km) to permit geological interpretation. 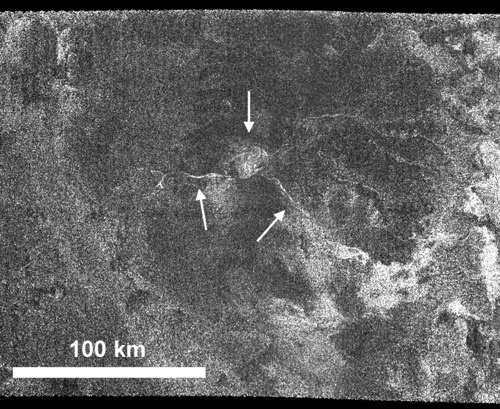 The first indications of cryovolcanic activity on Titan came in October 2004, when synthetic aperture radar (SAR) imaging from Cassini’s TA (Titan-A) encounter uncovered features suggestive of cryovolcanic constructs, including flows, sinuous channels, and the 180 km dome-like structure Ganesa Macula (Image 1; Elachi et al. 2005). 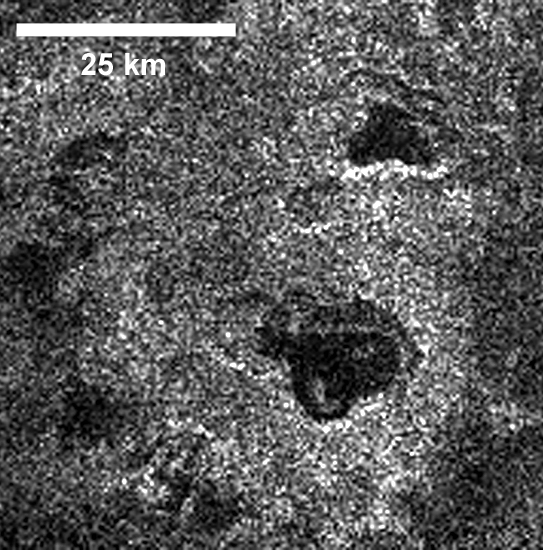 Cassini RADAR is able to map Titan’s surface at resolutions ranging from ~0.35 to 1.7 km/pixel. Image 2: A close-up of Ganesa Macula, showing its central bright feature (possibly a caldera) and two sinuous channels on its flanks. Ganesa Macula, located at 87 W, 50 N, has been interpreted to be a cryovolcanic dome or shield (Lopes et al. 2007). Ganesa Macula is a radar-dark, circular feature with rough flanks, sinuous channels and a bright region in the center (Image 2). Several interpretations have been made regarding Ganesa’s shape and rheology. Lopes et al. (2007) inferred it to be either a cryovolcanic dome or a volcanic shield. The radar-bright signature at the edges, particularly on the radar-facing slopes, is consistent with such a positive relief feature. Unfortunately, the great variation in backscatter on and around Ganesa makes it difficult to distinguish between the dome and the shield interpretation. Given the low volatile content of cryolavas on Titan and the high viscosity of water-ammonia mixtures, Lorenz and Mitton (2002) proposed that pancake-type domes could exist on Titan. Conversely, the morphology and size of Ganesa are comparable to shield volcanoes on Earth and Venus (Lopes et al. 2007). Features observed on and around Ganesa Macula are consistent with a cryovolcanic interpretation. Ganesa has a central bright region ~20 km in diameter that may be a caldera. In addition, at least four sinuous channels can be seen extending from the central bright region to the edges. These may be cryolava channels running down the flanks of the feature, or erosional channels carved by liquid methane. (Titan’s atmospheric methane plays a role not unlike that of water on the Earth.) Flows and sinuous channels are also seen surrounding the feature, preferentially to the east and southeast, suggesting a regional gradient. If Ganesa Macula is a volcanic feature, it may be an important astrobiological locale, as the cryovolcanic process provides a means of exposing surface organics to liquid water (Neish et al. 2006). Aqueous chemistry permits the hydrocarbons and nitriles formed by photochemistry in Titan’s nitrogen-methane atmosphere to form more evolved and oxidized prebiotic species, such as amino acids and nucleobases. Image 3: Complex of nested, partially-fluid filled depressions observed near Titan’s north pole with Cassini RADAR on July 22, 2006. These features are remiscient of crater lakes on Earth, which form over a partially emptied volcanic magma chambers (Mitchell et al. 2008). Radar illumination is from the top. In later fly-bys, the Cassini RADAR instrument identified several other potential cryovolcanic features on Titan, including lobate flow features and circular features that may be calderas (Lopes et al. 2007, Michell et al. 2008). Some particularly interesting features are observed near Titan’s north polar region. The Cassini spacecraft’s T16 fly-by revealed what appear to be nested, roughly circular features reminiscent of calderas on Earth, many of which appear to be partially fluid filled (Image 3). The nested lakes can be explained by a volcanic origin, since nested calderas often form over a wandering magma system and/or successively active magma chambers, as observed at Kilauea Caldera, Hawaii. Lorenz, R., Mitton, J. 2002. Lifting Titan’s Veil. Cambridge University Press, Cambridge, UK. 260 pp. Mitchell, K.L., et al. 2008. Titan’s north polar lake district: Insights from the Cassini Titan Radar Mapper. Icarus, in review.